Having a bike is not only convenient, but also a fun and effective way to exercise. As a hobby, cycling encourages you to get outdoors and see things you might not normally see, and can be relatively cheap to get into. We’re all tempted by a bargain, and some of the low-priced bikes on offer seem like the ideal way to start cycling without spending much money. We review cheap mountain bikes that are all under 500 pounds. If you don’t know what to look for, a cheap mountain bike can come with a host of problems. If you’re inexperienced in bike assembly and maintenance, there’s a risk of putting it together wrong. This will make it at best more difficult to operate, and at worst dangerous. Also, to keep the price low, the manufacturer may use cheap components which are liable to break easily. This can cost more in repairs in the long run than the bike was worth in the first instance. But budget bikes don’t have to mean such low quality that they’re not worth considering. There are some gems out there to be found for fantastic prices. 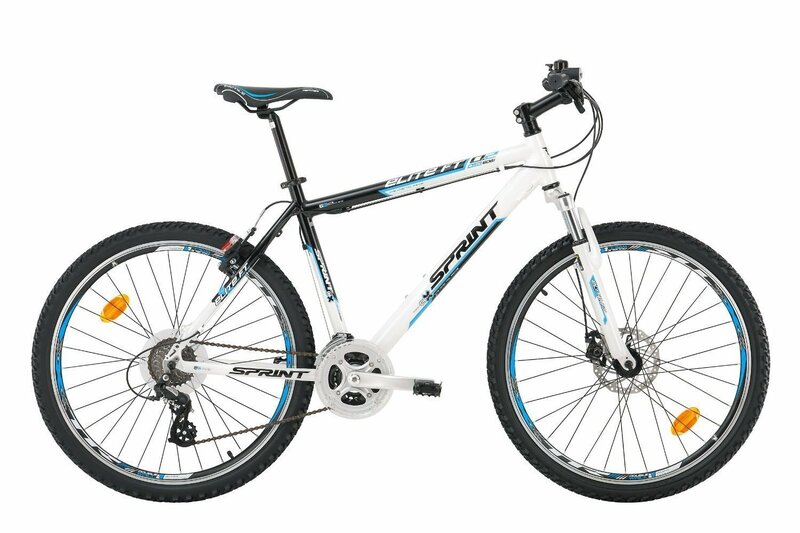 As the name suggests, mtb bikes are designed to handle rough terrain and perform well on steep hills. But don’t let that mislead you into thinking they’re not suitable for other types of cycling as well. The original purpose of mountain bikes means that they usually have good suspension. This will give you a smoother, more comfortable ride. And one of the main benefits offered by a mountain bike is versatility. While you might be planning on making most of your trips on roads and paths, having the option to go off-road if you want to gives you more scope to experiment with different types of riding. Mountain bikes also have a range of gears, making hills much easier on the legs. A mountain bike is the best option for those who don’t want to be limited to riding on just one type of surface. Materials used for bike frames vary, but at the lower end of the price range, you can generally expect to find either aluminium alloy (which is often called simply ‘alloy’ in the mountain bike world) or steel. Of these two, steel is more durable, while aluminium is lighter. Steel may also help to absorb bumps slightly better. Make sure you take into account the size of both the frame and the wheels, in order to get a bike that’s the right fit for your height. Not only will it be uncomfortable, but having a bike that’s too big or too small for you can be harder to control and less efficient. The size of the frame has more to do with your height. See below for our rough sizing guide. Originally, mountain bikes were all fitted with 26” wheels. 29” ones followed, and then 650b, which are around 27.5”. 26” wheels are still by far the most common, and are both lighter and stronger than the larger sizes, and accelerate faster. The benefits of 29” wheels are increased stability and a smoother ride on rough ground. 650Bs, as you might expect, are somewhere in between, offering some of the 29ers’ better handling off road with less sacrifice in terms of acceleration. One more point to bear in mind is that it can be difficult to track down spares for the larger wheels, particularly the 650b size which are relatively new. However, this is gradually improving as they become more common. Mountain bike suspension can be a complicated and confusing area, but it boils down to whether the bike has full suspension, or what’s known as ‘hardtail’. Full, or dual, suspended bikes have suspension a both the front and back forks. Hardtails only have it at the front. One thing to bear in mind here is that this may mean that the components in a hardtail bike are of better quality than those in a similarly-priced full suspension model. This is because the latter needs to cut costs in order to get the extra suspension component in. Overall, if you’re mostly going to be using your bike on the road, a hardtail is the better option as the rear suspension will be unnecessary. If you think you’ll be on rough terrain enough to warrant a bit of extra shock absorption, however, a dual suspension bike might make your cycling more comfortable. From the tyres and suspension to the brakes and gears, there are countless makes and models of components around. These vary a lot in quality and often prices are kept low on bikes by getting the cheapest possible. This isn’t always a bad thing, but it’s worth investigating specific parts further if you want to be certain. If parts are likely to break quickly, your cheap bike might end up not being such a bargain after all. That said, you can upgrade components gradually as you wish, as long as they meet a decent standard to begin with. Please see below for our recommended selection of top mountain bikes in the UK and worldwide. We have included bikes to suit all budgets under £1000. The good: Good value from a well-respected brand. Overall: Raleigh quality for a great price if you’re not bothered about suspension. At its height, the Raleigh company was a household name, and as it’s been in business for over 100 years, the respectability of the brand is not in question. Like the men’s Muddyfox bike, this Raleigh model has a steel frame, 26” wheels and 18 gears. However, it’s a ‘rigid’ bike, which means it has no suspension at all, front or rear. That’s not to say riding it will be uncomfortable, however. The lack of suspension components means that better quality parts can be used elsewhere on the bike for the same low price. If you think you’ll want to do a lot of cycling on rough terrain, it’s worth getting a bike with suspension. If not, this one has a lot to offer. The small amount of assembly required is straightforward, and the instructions are good. A sturdy, reliable bike that offers outstanding quality for such a low price. The good: Amazing value full suspension mountain bike. The bad: Not the best quality parts, but good enough. Overall: If you’re strapped for cash, you won’t regret buying this cheap men’s mountain bike. A dual suspension mountain bike for an absolute bargain price. Muddyfox is a trusted brand with a 25-year history. 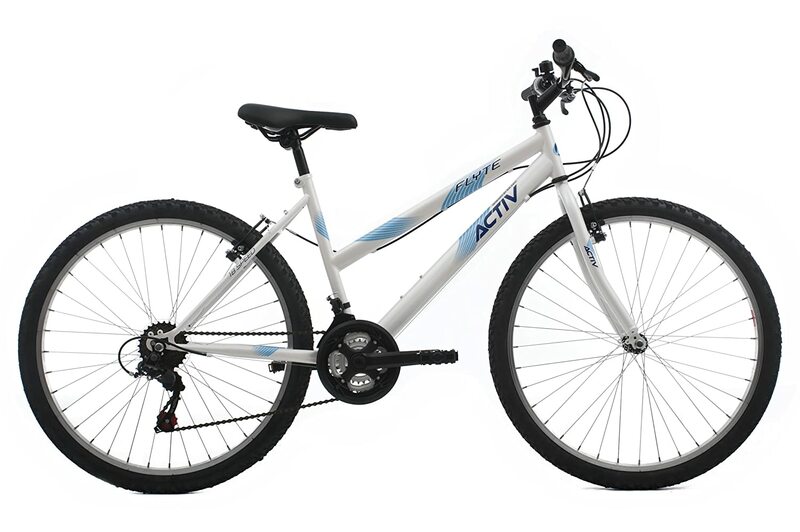 This particular model features a steel frame, 26” alloy wheels and 18 gears. If you’re not expecting much from a bike under £100, Muddyfox might pleasantly surprise you. The bike performs well on or off the road, with the suspension responding well to bumps. Most people won’t find assembly too difficult, and clear instructions are provided. At this price, some of the components may not last forever, but the price is so low that you’ve still got a bargain even if you need to spend a little more on new parts down the line. The good: Full suspension and good brakes. The bad: Components might not last. Overall: The best full suspension women’s mountain bike on a budget. The cheapest women’s full suspension bike in the list, the Taser II packs in plenty of quality without the price rising too high. The bike has a steel frame, 18 gears, and 26” wheels. It also has V-brakes, which will give you extra stopping power and work well even in wet or muddy conditions. The wheels in this case are a light and durable alloy. There’s minimal assembly needed, and it should be a breeze. 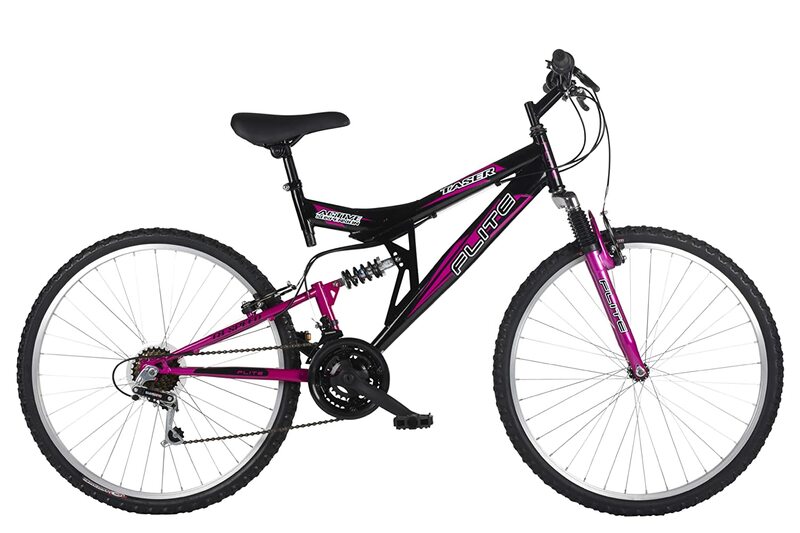 For only a little more cash than the women’s Raleigh, the Taser II gives you all the benefits of full suspension. The good: Nice quality parts, comes with lights. The bad: Lacks rear suspension. Overall: The quality of everything else more than makes up for the lack of rear suspension. This bike is a step up from the cheaper men’s bikes. It brings with it a range of benefits for the extra money. 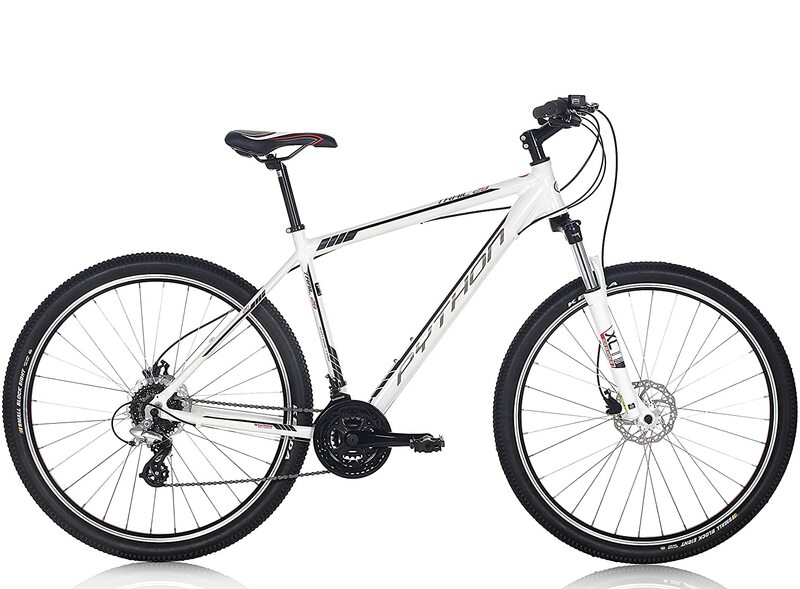 It boasts a more lightweight alloy frame and 21 gears, alongside the standard 26” wheels. The bike features a disc brake at the front and a rear V-brake. Both of these are of good quality, so you can rely on its stopping ability when you need it. It even comes complete with lights, so you won’t need to fork out extra to cycle safely at night. This model is a hardtail, so might not be what you need if you want to do a lot of rough terrain cycling, but the quality front suspension is sure to give most cyclists a smooth, comfortable ride. The overall quality of components is great, and the small amount of set-up needed means you’ll be up and running in no time. The good: A folding bike that’s suitable for more than just the city. The bad: Component quality isn’t the focus of this bike. Overall: If you want a mountain bike that can be easily folded, here it is. Generally, if you want the convenience and portability of a folding bike, it will come at the cost of versatility. The wheels of folding bikes are normally far smaller than average, meaning reduced efficiency and very poor handling on uneven ground. Not so with this unusual bike from Ecosmo, which packs full 26” wheels into its folding steel frame, alongside an impressive 21-speed Shimano gear system and full suspension. The quality of the Ecosmo bike’s components is somewhere in the middle – not amazing, but not terrible either. They’re unlikely to break quickly or present any urgent problems, but the selling point here is the full mountain bike spec in a folding model, so if that’s useful to you then you won’t be disappointed. The good: Great quality of parts for a very attractive price. The bad: 29” wheels are not everyone’s cup of tea. Overall: Still relatively cheap, but with a fantastic selection of components. Another offering from long-established experts Raleigh, the M-Trax Graben offers the more serious cyclist a host of extra features and upgraded components without having to spend a fortune. 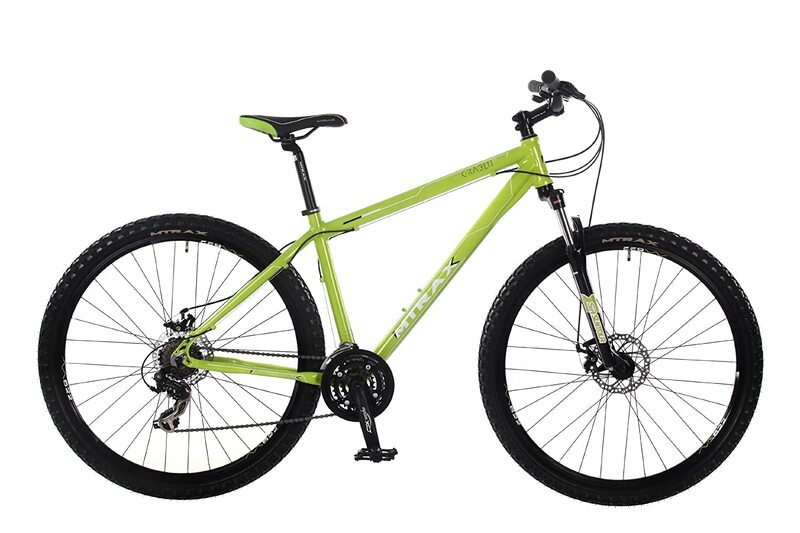 It features a sturdy and lightweight aluminium frame, 21 gears, 29” wheels and good quality disc brakes. Although it’s a hardtail and therefore lacks rear suspension, the larger wheels help to smooth out some of those bumps. Overall, the bike’s quality is clear in the way it rides, and the larger wheels mean it handles rough terrain and hills well. The reliable, branded components won’t let you down, and shouldn’t need replacing too soon. Again, the small amount of assembly needed shouldn’t take long thanks to the clear instructions, and if this is the sort of price you’ve budgeted for, you’d be hard-pushed to find yourself a better mountain bike than this. The good: Great quality, huge value for money. The bad: 29” wheels may be unwanted; tricky to assemble. Overall: The most expensive on the list, but also by far the greatest value. This is probably the best mountain bike under 500 pounds. It’s at the top of the cheap mountain bike price range. You might be wondering why it’s worth spending the extra money? The answer, pretty much, is quality of components. There’s quite a gap between this and other bikes in this list. The hydraulic disc brakes alone normally sell for over £100 so you can begin to see what sort of parts we’re looking at here. 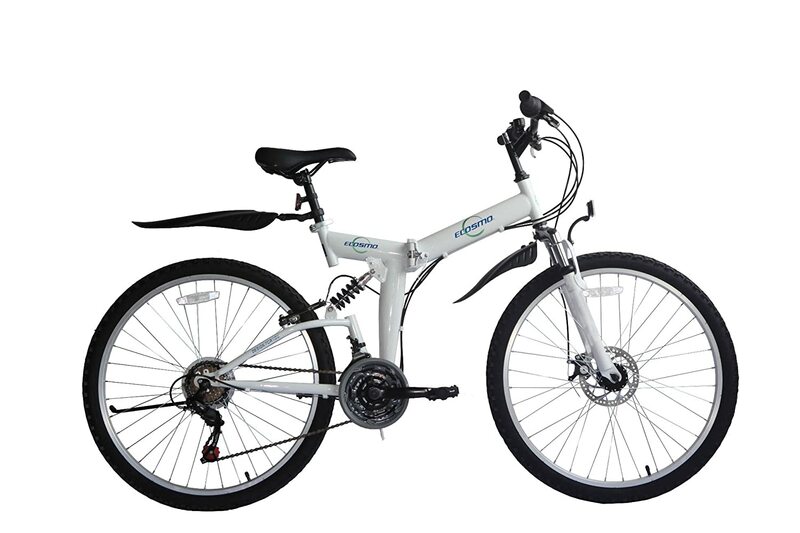 The bike has a high grade aluminium alloy frame, 29” wheels and a 24-speed gear system. All of these parts are of a high quality. Assembly isn’t as easy as some of the bikes here, but that’s a small price to pay for such a bargain-priced piece of kit. This is one that is built to last, can handle some pretty extreme ground types, and won’t let you down. If this is the sort of price you’re looking at, this bike couldn’t be more highly recommended. 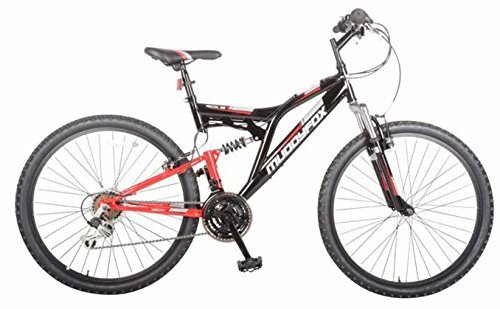 What size mountain bike should I get? Mountain bikes are normally sold by the size of their tyres. This has more to do with the control and feel of the bike – nothing to do with height. Instead, you need to look at the frame height. The frame is measured from where the crank enters the bike to where the seat-post begins. According to Wikipedia, mountain bikes first appeared in the 19th Century. The first off road bike appeared in an expedition from Missoula to Yellowstone in August 1896. During the 20th Century, racing cyclists began riding off-road to keep fit during the winter months. In 1955 the Rough Stuff Fellowship was established here in the UK. In 1966 in Oregon, D. Gwynn built a bike designed for rough trail. He named this bike a “mountain bicycle”. This may be the first appearance of the name. With cheap mountain bikes, it’s fair to say you get what you pay for. The biggest difference between cheap mtb bikes is the standard of their components, but all of those listed here are of a high enough quality that you won’t regret buying one. The questions to ask yourself revolve around not just what you can afford to pay, but also what your cycling goals are and whether they’re likely to change in the near future. Parts can be upgraded if necessary. However, if you think you’ll want to do that, it may be worth spending more to begin with to minimise the need for this. It will save you money in the long run. While all of these bikes need some level of assembly. It can worth spending some of the money you save by buying a cheaper model on getting it professionally set up and checked. This won’t cost very much. It will, however, ensure that whichever bike you choose, you can get as much enjoyment out of it as possible, for as long as possible.